Over the past decade, architects Marisa Yiu and Eric Schuldenfrei have constantly pushed the boundaries of architecture and design, working on everything from a biennale in West Kowloon to a lounge at Art Basel to concepts for towering “urban greenhouses” in Aberdeen. So to mark the 10th anniversary of their studio, Eskyiu, it’s only fitting that rather than looking back on what they’ve already achieved, they are once again trying something entirely new. From November 17 to 28, Eric and Marisa, who’s on this year’s Generation T list, are staging an interactive exhibition at the Quarry Bay gallery Artistree. Eskyiu Playkits will showcase “transformable objects” exploring themes of sustainability, place-making and play. Before it opens, we get a first look at the exhibition’s most exciting features. 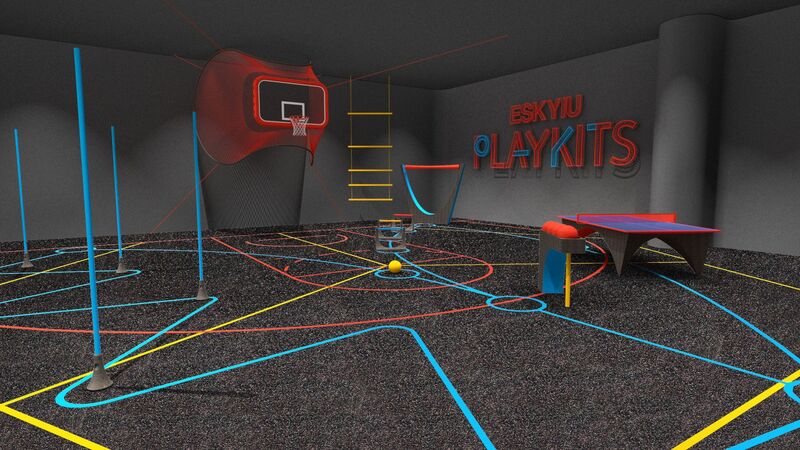 For Eskyiu Playkits, Eric and Marisa are transforming Artistree into a multi-purpose space that can host a variety of sporting events, ranging from circuit training to ping pong to parent-and-child yoga classes. These classes will run from November 17 to November 22 and members of the public can register here to take part. All these sporting events are co-hosted by Nike, the exhibition’s main sponsor. On top of being a space for sports and exercise, Eskyiu Playkits can also transform into a room for creating—and listening to—music. From November 24 to 27, the Hong Kong New Music Ensemble will be using the space to explore sounds that their members have recorded around the city. These sounds will then be reinterpreted by the group and composed into a new work of music to be played on the guqin instrument. Marisa and Eric asked a series of leading creatives to design logos for Eskyiu Playkits. This one was designed by Michael Young. Whether it’s being used as a space for sport or music, Eskyiu Playkits is all about exploring the importance of different communities in Hong Kong and how these groups work together to create the vibrant, diverse city we all know and love. A physical manifestation of this idea is the Eskyiu Playkits Community Wall, which is made up of bricks that were individually designed by figures who shape Hong Kong, ranging from people working for NGOs to industry leaders. On November 22, businesspeople, entrepreneurs and creatives working in Taikoo Place are taking part in a roundtable discussion at Eskyiu Playkits. Themed “When Work is Play”, the talk will cover the importance of play and creative thinking in the workplace, as well as exploring how the nature of “play” is changing in the 21st century. Many of the objects and surfaces in the exhibition are made using Nike Grind, a range of regenerated materials created from recycled athletic footwear and manufacturing scraps. And the recycling doesn’t stop there—after the exhibition, the Nike Grind objects will be donated to a local school, so nothing goes to waste.